If you want things to stay the same, hire a good manager. If you want risk, innovation and change, hire a good leader. As I do not have permission to share the slide nor the material directly, please understand that what I am posting here is my understanding of what was said and the notes I jotted down from the talk. Any mistakes or flaws in theory are mine. Good managers are systematic and patient. They are objective and they compromise and reconcile differences. Leaders, by comparison, are emotional and subjective. They are uncompromising and intuitive and, interestingly, anxious. By the way – please note that a good leader is not “better” than a good manager, nor vice versa. They perform different functions. I think that your reaction to LL/SL9B will be governed a lot by whether you think like a leader or think like a manager. Are you are looking for a leader or a manager for your SL experience? I don’t know if I’m a leader or a manager. I think the best compliment I have ever received was from one of my mentors who said “She makes things happen.” I look at the adjectives for leaders and managers and I see myself on both lists and on neither list. *grin* But here’s my thinking at this moment…. Maybe a good manager might help at this stage. Someone who could find the proper person at LL with the authority to have a conversation. The manager could try to negotiate a compromise: LL provides sims and the residents (users) can run the event. It’s been done in the past (I believe for SL2B and SL3B). Once the manager changes LL support to limited LL sponsorship, it will be time for the leaders to stand up and bring SL9B on home. Things are a bit turbulent in my life these days. My husband suffered a serious accident and much of my time, energy and thoughts are dealing with the aftermath of that. Most of the “heavy lifting” part came immediately after when I was helping my sister with 1st night seder for 26, then my 2nd night seder for 16, Pesach brunch on Sunday, and putting back all the tables, furniture, dishes, etc. on Sunday and Monday. Yeah, some people will do ANYTHING not to help. *laughing* But since my husband already helped with a ton of the preparatory cleaning, his timing wasn’t all THAT escapist. I’ve not been inworld much lately. I mostly get there for Friday nights at Tribeca and maybe another evening or two for some music or a chat. Since the accident, I’ve been inworld every night. It is my community, my support network. Immediately after the accident, people were in an out of our house for three days. They were visiting my husband and here for the holiday. But then comes Monday and everyone goes back to their routine. Except for the 2 of us. Our routine is a bit disrupted. So we get a few phone calls, a few emails, a few pokes on Facebook and that is as it should be. But I find that I am craving some sort of balm for my stress. I’m finding it inworld. I don’t know how you get people to survive the first hour experience. I don’t know what makes one person decide to live in SL and another decide to leave. All I know is that I am still at home in SL. This is still one of my major communities, one of my major networks of support and love. There is nearly always a friend online. I can reach out to a friend and say – please, come dance with me, I need to feel arms holding me for a bit. I have friends who give me virtual hugs which I can feel on my skin. I have friends who will distract me with chat or listen to me vent my frustrations with the medical process. Always there is the music. I have blues music playing on my home property if I don’t want to interact beyond a chat. I go to FogBound where there is always a DJ playing fantastic music. I am a regular, a Fogette, and there is always someone there to say “heya Ahuva, how are you today?”. Monday nights I usually catch Taunter performing live. Last night karma was kind and one of my favorite live performers returned to SL. Last night (BigJim Allerhand (BigJim Adam in RL) returned to Club CTO. He’s been absent awhile now while he was winning acclamation in the physical world. He was playing with Uncle Leeeroy and CharlieJosh Digfoot. They play blues and pickin’ til you are moving right along, playing the air washboard. 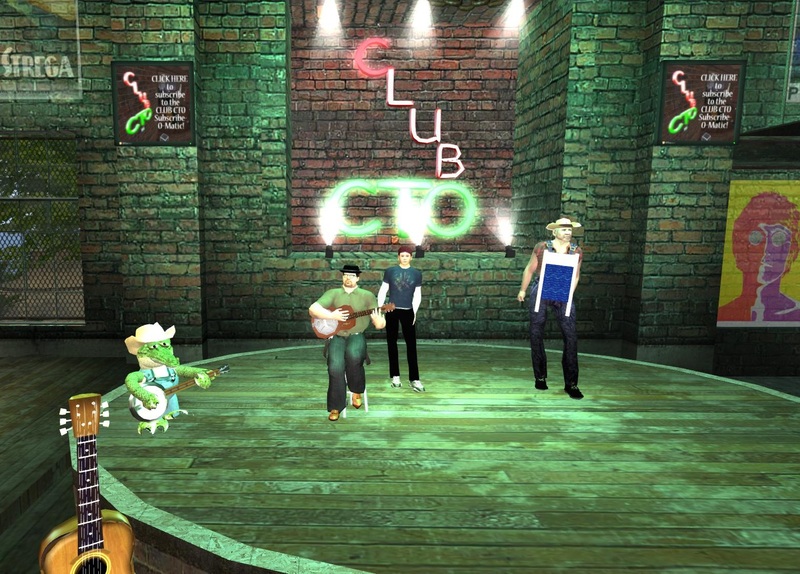 You know a musician is A-1 quality when the other SL musicians are there in the crowd. 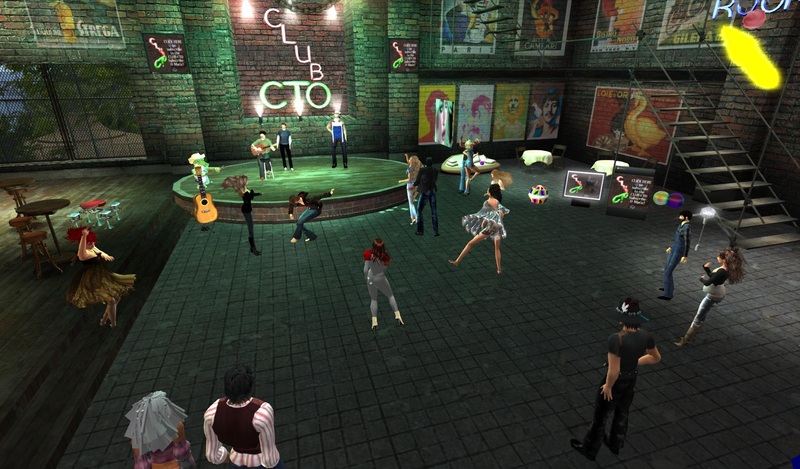 Taunter left for her own performance before I snapped the photo, but there is at least one other big-name SL musician in that crowd, not including club owner Cranston Yordstorm. There were a lot of familiar faces there – folk that I see when I’m listening to Von Johin and Ziffy Zarf and Noma Falta and other top-notch performers. Yep, I’m going to be inworld again tonight (after I do this evening’s running about). I’ll be sure to stop in at FogBound and then be wherever the music takes me. My sanctuary of sound. This is a video about an incredibly imaginative, creative, determined 9 year old boy living in East LA who built his own game arcade out of cardboard boxes, tape, string and other odds and ends. 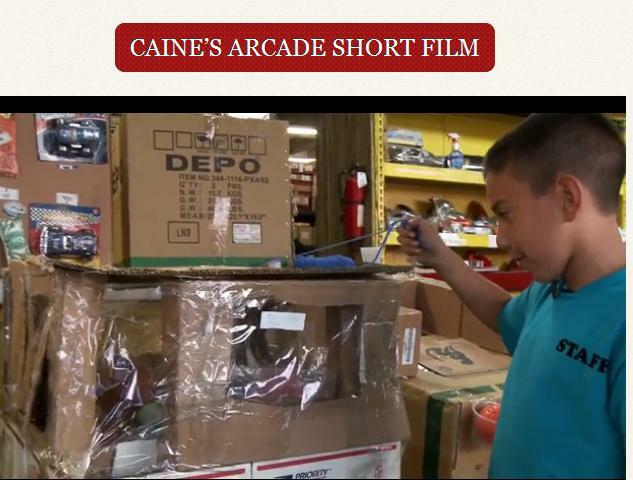 Caine built his arcade in his dad’s store. Caine’s dad sells auto parts, mostly via the internet, so there wasn’t much walk-in traffic to see the arcade. Until Nirvan Mullick came looking for a part. And found the arcade. Nirvan was inspired to make a short film about Caine and generated a flash mob to come and play. This 11 minute film will make your heart soar. Look at the smile on that child. Look at the intelligence, the determination, the joy.